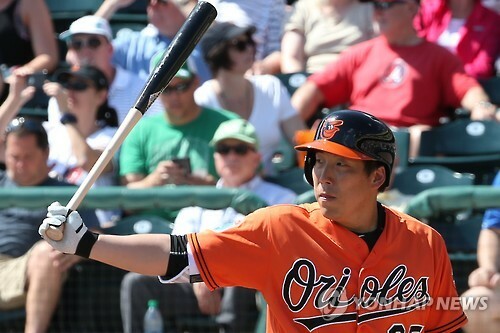 SEOUL, April 1 (Korea Bizwire) – South Korean baseball fans are angry with news that the management of the Baltimore Orioles had internal talks about sending Kim Hyun-soo to the minors. Fans were even outraged when a Fox Sports report mentioned that the Orioles discussed sending him back to South Korea. Kim Hyun-soo signed a $7-million contract with the Baltimore Orioles last December. He was touted as a left-handed hitting corner outfielder who can hit for a decent average and gap power and reach base consistently. Kim was one of the most beloved Korea Baseball Organization (KBO) players, and was known to have the least number of anti-fans. Many baseball fans were genuinely happy when he set foot in America to start a new baseball career. However, his skills and potential didn’t seem to show much this month, and plummeted to a point where Orioles’ management is openly discussing the possibility of sending Kim to the minors at the start of the season. A KBO batting champion at age 20 in 2008, Kim went hitless in his first 23 at-bats. He strung together an 8-for-19 streak to reach the Mendoza Line, but his batting average dipped to .182 after two more hitless games. Kim, who has no extra-base hit in 44 at-bats, hasn’t played since March 26. Along the way, manager Buck Showalter’s patience started to wear thin, even though he claimed he knew Kim would need time to adjust. Only 20 days later, he is now saying he has spoken to the player about accepting the assignment to the minors. Showalter said Wednesday Kim will not play in any games while his status remains in limbo. Dan Duquette, the club’s executive vice-president of baseball operations, recently told local media that Kim is not going to be on the 25-man roster at the start of the season, before he’d even had discussions with the player about the minors. Duquette’s comments were first reported Wednesday (Korean time), after the team had been mum about a Fox Sports report from the weekend that the Orioles once had internal discussions about shipping him back to South Korea. The Baltimore Sun reported that Kim “was more receptive” about going to the minors in his second meeting Tuesday with Showalter and Duquette. Kim has the right to refuse assignment to the minors. Yet a source close to the player told Yonhap News, a Korean news outlet, that Kim hasn’t made a decision yet. The comments and actions taken by team management made South Korean fans feel that the club is unfairly pressuring Kim into making a decision after only giving him limited opportunities. South Korean news articles that translate quotes by Duquette and Showalter are accompanied by angry responses and comments directed at Showalter and Duquette as well as the club. Many of the South Korean fans also see the Orioles’ action as not just an insult to Kim, but to Korean baseball as a whole, and they’re concerned that the Orioles are setting a bad precedent for others who would want to follow in Kim’s footsteps to the majors. South Korean fans remember their KBO players having a bad history with the Orioles. Veteran reliever Chong Tae-hyon was nearing a deal with the Orioles in 2011 but failed the club’s notoriously stringent physical. The following year, the Orioles breached an agreement between the KBO and MLB when they signed underage high school pitcher Kim Seong-min. Before the 2014 season, the Orioles signed former KBO MVP-winning pitcher Yoon Suk-min, who spent one year in Triple-A Norfolk before returning to South Korea. Fans are outrageous at how the Orioles treated Kim, but are also feeling uneasy about cold-hearted American capitalism.